HydroMax, Inc. works with you to determine the treatment process required for your particular commercial or industrial application. Scroll down to read more about the System Design & Pilot Testing process, or click on our Gallery page to view photos of past testings. Data Sheets and Application Questionnaires are also available below. Maximizing the use of dwindling, increasingly costly fresh water supplies, reduction of wastewater discharge volumes, efficiency and cost savings gained by recovering pure water or chemical solutions from processes for reuse, complex water extraction and precious material or food source concentration or purification are all examples of applications in which HydroMax advanced membrane fluid separation systems excel. The extreme variety of these water technology applications generally requires knowledgeable and creative engineering skills and utilization of robust and reliable system design, components and materials of construction in order to combat sometimes incredibly harsh operating conditions that can be involved with industrial processing environments and solutions. The first step in the evaluation of a new water processing application is the collection of relevant information regarding the nature and configuration of the client’s water process. Process operation details, water flow and quality requirements, typical operating problems being caused by water issues, envisioned goals to be attained by specialized process water treatment and other information needs to be submitted to, and reviewed by, HydroMax, Inc. so that system design options can be developed and recommendations can be provided. Application questionnaires are available here, and can be submitted online to initiate the review and evaluation process. Since every potential application is unique, HydroMax, Inc. begins the equipment selection process by analyzing the target water or solution composition. HydroMax, Inc. then uses its experienced design engineering capability to develop a system of technologies that will effectively achieve the recovery goals of the process and generate operating performance projection models to verify the performance capabilities of the selected equipment. In order to determine the feasibility of successfully implementing HydroMax, Inc. purification technologies to meet the objectives of most unique process water purification, concentration or recovery applications, and to evaluate various processing system configurations, it is frequently imperative to perform basic, small-scale process simulation. Feasibility testing is generally performed with equipment that is limited to a single pass process treatment and is only intended to assess the limited performance time of the selected technologies. Samples of solution shall be collected from before and after processing with each technology tested in order to determine effectiveness of treatment technology methods only. Solution samples should be analytically tested for the presence, or lack of presence, of critical constituents. Clients may participate in obtaining analytical results if equipped with a laboratory and are familiar with performing testing for specific process water or solution parameters, or HydroMax, Inc. can provide the appropriate sample collection and analytical services using field test equipment. HydroMax, Inc. can also have samples analyzed by any of our certified laboratory partners. 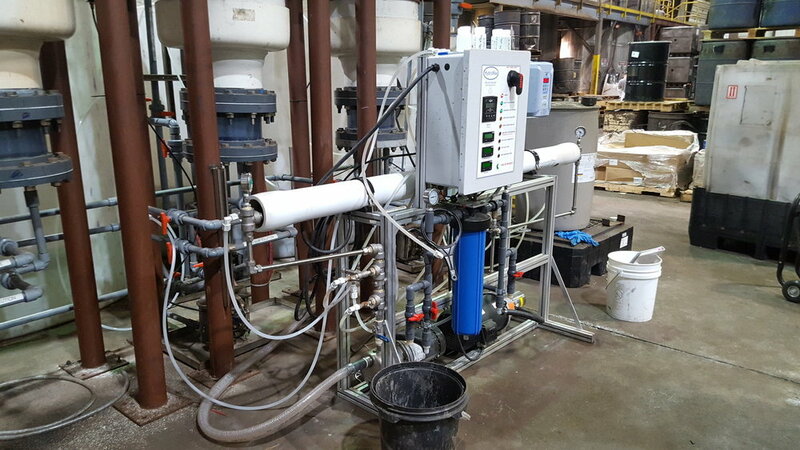 This feasibility test is normally performed at HydroMax, Inc.’s Process Test Laboratory and utilizes a small-scale treatment system to mimic the operation of a full-scale system as required to treat this process solution. A small volume (between 5 and 55 gallons) of actual product solution from the actual process is commonly used during feasibility testing. HydroMax, Inc. shall provide return delivery of segregated volumes of processed purified and of concentrated liquid, and all unused or excess solution retained during processing for evaluation by the client and for proper recovery or disposal. HydroMax, Inc. offers custom configured “TEST PALLETS” that include appropriately sized drums for raw process water, purified water, and concentrated water plus any specific sampling bottles, pumps or other supplies and documentation required to make sample collection and feasibility testing simple. Following completion of the physical feasibility testing process, HydroMax, Inc. shall provide a written Engineering Evaluation Report that will include comments on processing ability of the various purification technologies, sample analyses results (as shared with HydroMax, Inc. by client) and recommendations for further on-site, extended Process Functionality Pilot Testing, if deemed beneficial. Once it is determined that the selected purification, treatment or separation technologies are capable of attaining the desired goals of the application, an expanded testing format is needed to be undertaken in order to further determine if the process is sustainably functional and to develop an effective operating strategy that will help to optimize a full scale system’s performance. Functionality Testing can be performed on-site or, at least preliminary, at HydroMax, Inc.’s Process Test Laboratory. Alternatively, it can be performed at the Client’s facility as a Pilot Plant Operation in order to have access to much more liquid and to allow for an extended test time so complete system operation can be assessed in miniature. Functionality Testing will significantly assist HydroMax, Inc. engineers in properly estimating scaling required to meet full-scale system capacity requirements and helps to identify performance challenges and limitations that might not otherwise be anticipated. This advanced introduction to operating challenges helps HydroMax, Inc. to design preventative measures into the initial full-scale system instead of later, during live system operation.